Coast Diamond is thrilled to announce our featured retailer of the week, Robbins Brothers of Southern California, Texas, Washington and Arizona. The Robbins Brothers legacy in serving customers’ engagement ring needs goes back to the 1920’s. Before “Robbins Brothers – The Engagement Ring Store” there was “Ben Tipp Diamonds” in Seattle, Washington. Mr. Tipp set himself apart with excellent customer service, and offered a Washington red apple to each customer as they browsed the store for the perfect engagement ring or gift. Eugene Robbins was the second generation of Ben Tipp Diamonds. When he had a desire to move his family to Southern California in the 1950’s, he purchased WM Pitt Jewelers in Pasadena, California. He raised his sons, the Robbins brothers, to enjoy doing chores around the store and they naturally learned the importance of impeccable quality in both diamonds and customer service. In 1995, with the purpose of focusing on couples in love, the Robbins brothers opened the very first “Robbins Brothers, World’s Biggest Engagement Ring Store” in Fullerton, California. Today, in just over 20 years, Robbins Brothers – The Engagement Ring Store has 15 locations in California, Texas, Washington and Arizona. They are passionate about creating an unforgettable engagement experience for all of their couples in love. Robbins Brothers’ You Tube channel is full of fun proposals, some of them planned with the help of Robbins Brothers’ staff. The video below shows how Robbins Brothers helped plan a surprise proposal, and the groom chose a gorgeous Coast Diamond halo engagement ring. Robbins Brothers and Coast Diamond have worked hand-in-hand for years to make couples’ dreams come true in finding the perfect engagement ring. We invite you to stop into Robbins Brothers soon, where you will find these Coast Diamond rings and many more to choose from. After all… Robbins Brothers is The Engagement Ring Store. Robbins Brothers: Coast Diamond graceful wedding set (LC5250_RG-WC5250_RG) featuring a rose gold shank set with diamonds, and a white gold 6 prong setting for the 1 CT center diamond. Robbins Brothers: Coast Diamond classic cushion-shaped halo engagement ring (LC5256_YG) with diamonds cascading down the shoulders, set in yellow gold. Robbins Brothers: Coast Diamond brilliant double halo engagement ring (LC10021) with a 2 CT center stone and diamond encrusted split shank. Shown with matching fitted band (WC10021). Congratulations Robbins Brothers for being selected as our Coast Diamond Featured Retailer of the Week! Darrell Beard is the founder of Beard Fine Jewelers in Lufkin, TX. His passion for jewelry began at the young age of fifteen when he learned jewelry repair and the beginnings of the jewelry business. After college, his love of the business took him from New York to Baton Rouge, Louisiana. Mr. Beard’s knowledge of the ins and outs of the jewelry business grew, as he was involved in everything from the manufacture to the merchandising of fine jewelry. His dreams finally came true when he opened the doors of his own Beard Fine Jewelers in Lufkin over 30 years ago. Today Beard is known for their talented designers and personalized customer service. Coast Diamond is thrilled to feature Beard Fine Jewelers of Lufkin, TX as our retailer of the week. Stop into Beard Fine Jewelers to start customizing your Coast Diamond ring today! Coast Diamond is proud to call Van Cott Jewelers of Southern New York our featured retailer of the week. Van Cott Jewelers is rich in history dating back to the early 1900s. It all began before World War I when Rubine Levine began work in a jewelry factory at the age of 15. After his service in WWI, he returned to start Ruby Jewelry Company and sold everything from jewelry to eyeglasses door-to-door to the immigrant shoemakers in Binghamton, NY. His fluency in eight languages allowed him to serve this immigrant community, where he became known for his kind and trustworthy manner. Rubine Levine was the first generation of jewelers in the Levine family. The current generation of Van Cott Jewelers: Bill Levine with wife, Birdie and father, Herbert circa. 1979. Today, Van Cott Jewelers is in its third generation. Bill and Birdie Levine continue the traditions of kind and trustworthy service in two southern New York locations, Town Square Mall in Vestal and Oakdale Mall in Johnson City. Coast Diamond has a rich tradition of expert craftsmanship and exquisite design that are a perfect pair for the long history of wonderful customer service that Van Cott Jewelers offers their customers. When you stop into one of their two locations in southern New York, we know you will want to experience the beauty of one of these classic Coast Diamond engagement rings. Keep your eye out for the “surprise” diamond in some of our Coast engagement rings. Van Cott Jewelers: Coast Diamond classic halo engagement ring (LC5205YG) with a brilliant yellow gold band. Van Cott Jewelers: Coast Diamond romantic solitaire engagement ring (LC5226) with pave diamond petals around the center stone. Van Cott Jewelers: Coast Diamond classic wedding set (LC5219-WC5219) with brilliant round diamonds on the shoulders of the bands and a peek-a-boo diamond surprise. Congratulations Van Cott Jewelers of Southern New York for being our Coast Diamond Featured Retailer of the Week! Coast Diamond is thrilled to announce Galloway & Moseley Fine Jewelers as our featured retailer of the week. Galloway & Moseley Fine Jewelers have been serving the families of South Carolina since 1935. This long-standing ability to serve South Carolina in the fine jewelry business is possible because of their commitment to excellence and customer satisfaction. These keys to success are tradition at Galloway & Moseley and ones they enjoy sharing with every customer they have the opportunity to serve. Click here to read about the history of Galloway & Moseley from the owners,Danny Chandler and Britton Moseley, in Joo Mag Inc’s She Magazine. A fantastic selection of fine jewelry and gifts at incredible prices is a hallmark of Galloway & Moseley that owners, Danny Chandler and Britton Moseley, are dedicated to bring to their customers upon every visit. Their highly trained staff and their pursuit of the most current in fashion and fine jewelry trends have earned them the area’s exclusive honor as Master IJO Jeweler. The Galloway & Moseley customer can have complete confidence that their needs will be served, whether they are spending $500 or $50,000 on their fine jewelry gift. 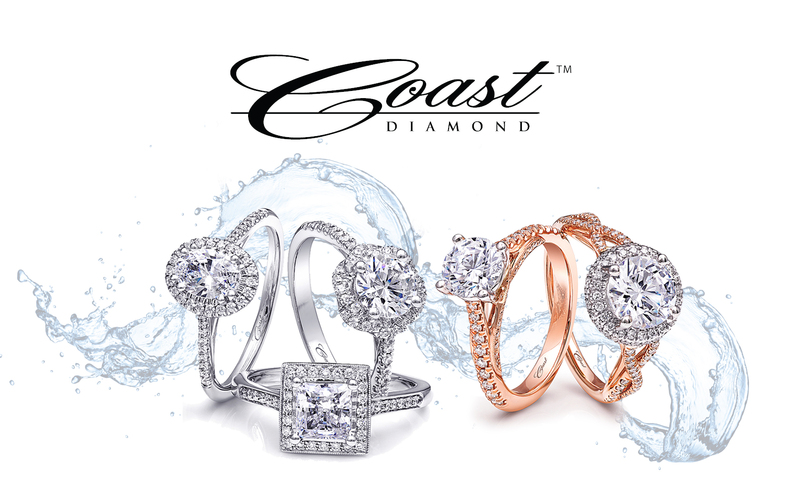 Coast Diamond shares the passion of bringing excellence in design with the best possible value in each piece of fine jewelry our owner and designer, Jay Gilbert creates. At Galloway & Moseley you will find the most brilliant of bold, as well as beautifully classic Coast Diamond engagement rings. No matter your preference, you must stop into Galloway & Moseley to try on these gorgeous Coast Diamond rings. Galloway & Moseley: The award winning Coast Diamond rose gold wedding set (LC5410-RG, WC5410-RG) with petite cushion-shaped halo. Galloway & Moseley: Coast Diamond 1.5 CT engagement ring (LZ5016) surrounded by a spectacular halo of round diamonds that continue down the shoulders of the ring. Galloway & Moseley: Coast Diamond stunning and classic 1.5 CT engagement ring (LJ6033) with matching wedding band (WJ6033). Congratulations Galloway & Moseley of South Carolina for being Coast Diamond’s Featured Retailer of the Week!